The founding members of the Friary Community are a diverse group of people who believe that the old Anglican Friary in Kenmore Hills has much to offer as a place of peace, solace, spirituality, restfulness and creativity within the Christian family, and would like to share it with others. We come from many backgrounds, have many talents and offer many gifts to the community. We explore and celebrate ideas, music and the arts, enjoy the presence of each other, strive for justice and peace in the world, and try to live our ideals. We welcome people whoever they are and whatever they believe who bring experiences harmonious with the central role of the Old Friary as a place of spiritual significance. This includes presence, goodness, talents, gifts of being and creative and healing skills to enrich our lives and the lives of others in the community. We hope that our membership will include people of good will everywhere who value the contribution made by the Old Friary to the local community and the events that they encounter within its grounds. We work in partnership with the Anglican church administrators to help the Old Friary remain a lively and enlivening place. Anyone is welcome to become a member of the Friary Community. To apply, simply fill in the online form (provided here). You may also email Ian Ross at admin@friary.org.au with your contact details and a brief reason you would like to join. We will advise you of the outcome by return email. 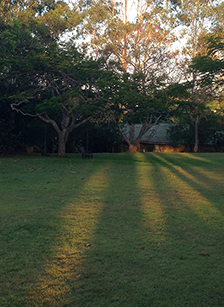 The Old Friary is a special centre of the Anglican Church under the administration of the Ministry Education Commission (MEC) based at St Francis Theological College in Milton. The Director of the MEC is Bishop Jonathan Holland. The formal name of the Old Friary is the Centre for Christian Spirituality (formerly Brookfield Centre for Christian Spirituality). The on-site Caretakers are Angie and Marcus Wilson. Angie is also the Administrator and is the point of contact for enquiries and to take bookings for hire of the facilities. The Friary Community members work with her to make the Old Friary a vital, living Centre of the Church in Brisbane, a milestone on the global map in terms of Christian Spirituality and a revered and loved centre for the local community. (e) To make it easier for community and church groups to find and use the Old Friary for their activities, thereby keeping it viable and ensure its continuity.